The Route of Parks of Chilean Patagonia is a 1,700-mile (2800 km) scenic route spanning 17 National Parks between Puerto Montt and Cape Horn in Chile’s far south. The route connects the Carretera Austral—which winds its way along Chilean Patagonia—with the Patagonian Channels and the Ruta del Fin del Mundo (“The End of the World Route”), featuring many other spectacular highlights along the way. The route’s pristine landscapes, diverse ecosystems, and local and endemic flora and fauna––combined with the rich history and cultural heritage maintained by the more than 60 local communities living in the region––make this destination truly one-of-a-kind. The Route of Parks also forms part of a new vision for conservation in Chilean Patagonia. Through tourism that safeguards the natural and cultural riches of this special place, this vision both protects nature and fosters the economic development of local Patagonian communities. 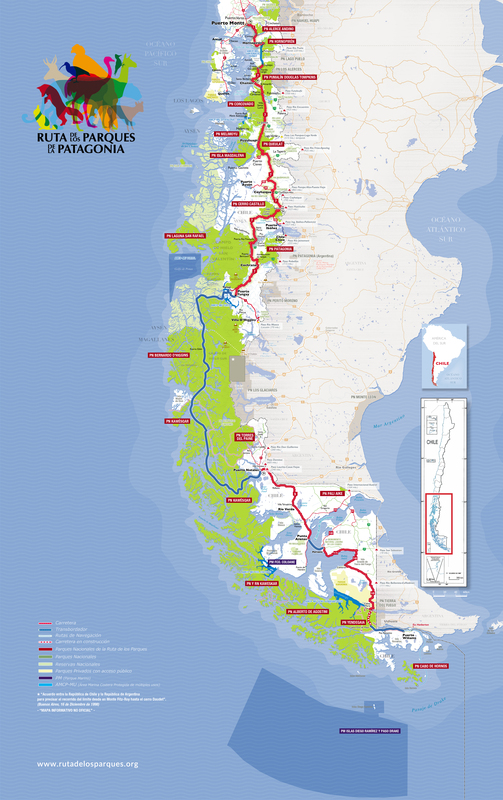 The Route of Parks of Chilean Patagonia is an initiative of Tompkins Conservation, a foundation that has worked for more than two decades in Chile and Argentina to create National Parks, rehabilitate wildlife, implement ecologically-minded farming practices, promote the well-being of local communities, and support environmental activism. To be recognized as the most important conservation route in the world, promoting Chile as a pristine natural destination for outdoor tourism as well as becoming an international model for ecologically-minded economic development. Promote and protect the natural and cultural heritage of the Chilean Patagonia and the 17 National Parks that make up the route, in addition to fostering economic development through tourism that safeguards the natural riches of this special place. To become the route connecting the largest number of National Parks in the world, thereby strengthening Chile’s international image, creating opportunities for economic development, and inspiring local communities to value and protect their natural heritage, viewing it as a source of belonging and pride. The route comprises more than 90% of Chilean territory protected under the category of National Park. It features more 28 million acres of pristine ecosystems, home to species at risk of extinction, such as the Alerce (Fitzroya) tree, the Canquén Colorado (Ruddy-Headed Goose), the Pudú Deer, the Huemul (South Andean Deer), and the Huillín (Southern River Otter), among others. The route assists in the economic development of more the 60 local communities, through ecologically-minded tourism that spurs investment as well as the local job market. In the United States, for example, for each dollar invested in National Parks, six to ten dollars end up returning to the local economy. The Route of Parks stretches along one-third of Chile, connecting 17 National Parks and spanning three regions of Chile (Los Lagos, Aysén, and Magallanes). It includes the Carretera Austral, the Patagonian Channels, and the Ruta del Fin del Mundo (“The End of the World Route”). The Route of Parks strengthens Chile’s image as a world-class destination for nature lovers and outdoor enthusiasts, bringing increasingly more tourists to the country. In 2016, over half of foreign visitors to Chile were attracted to the country for its outdoor and adventure offerings, and in 2017, tourism in Chile increased 14%. How was the Route of Parks created? In March of 2017, Tompkins Conservation signed an unprecedented agreement with the Chilean government. The foundation donated more than one million acres to create five new National Parks (Pumalín Douglas Tompkins, Melimoyu, Cerro Castillo, Patagonia, and Kawésqar), and expand three others already in existence (Hornopirén, Corcovado, and Isla Magdalena). To achieve this, the Chilean government also contributed nearly 2.5 million acres and reclassified 5.4 million acres of nature reserves as National Parks. These new National Parks, along with those already in existence, helped to form the Patagonian Route of Parks: 28 million acres of protected land in 17 National Parks––the equivalent of three times the size of Switzerland, or more than twice the size of Costa Rica. The route features more than 90% of land protected under the category of National Parks in Chile. Spans more than 1700 miles, or 1/3 of Chilean national territory. Protects 28 million acres of land in 17 National Parks. Features more than 60 local communities. Features 46 species of marine and land mammals. Different types of native forests. National Parks are the oldest and most enduring conservation strategy. “National Park” is the highest category of protection for a geographic area and the strongest guarantee that an ecosystem will be cared for and preserved not only for today, but for generations to come. National Parks play many different roles, including providing havens for biodiversity, helping to combat climate change, bolstering local economies, protecting natural and cultural heritage, and offering ideal spaces for recreation and scientific research. National Parks are essential for maintaining the natural cycles and systems that nurture our planet’s diversity of life. They’re also democratic institutions with deep, transformative power. These spaces––open to everyone, equally––provide visitors with a beautiful, wild environment that encourages reflection on the relationship between nature and society. National Parks show us how to foster rich, unfettered ecosystems, supported by a culture that deeply values biodiversity and natural life. They also provide a model for cultivating vibrant communities filled with people who understand the sense of belonging and local identity that only a deep connection with nature can provide. National Parks, in all their beauty, are a powerful reminder of the abundance that can be found in caring for the well-being of our planet––and the well-being the natural world offers to us in return.